Arsenal coach Arsene Wenger will face his old club, AS Monaco FC, for the first time in his 16-year stint with the Gunners. Monaco, who are currently placed fifth in the French League, Ligue 1, will face a formidable opponent at the Emirates stadium on the night of 25 February. The Gunners were undefeated in all their Champions Cup Group matches at home and tied the cluster with Borussia Dortmund at 13 points but emerging second on goal difference. After running into opposition like Bayern and Barcelona in the Round of 16 in the previous two seasons of the Champions League, the Gunners will probably look forward to Wednesday night's clash with some relish. But the French club has been at their parsimonious best, hardly allowing in any goals of late. In the 14 games they have featured in since the Champions Group matches, the team hasn't conceded once in the 9 matches they won. The only one they lost was to Guingamp and it took Dorian Leveque's lone strike to break a 842-min goalless deadlock for keeper Danijel Subasic. By letting in just 19 goals from 26 matches, Monaco shares the the honour of conceding the least number of goals in the current Ligue 1 season with Lyon. 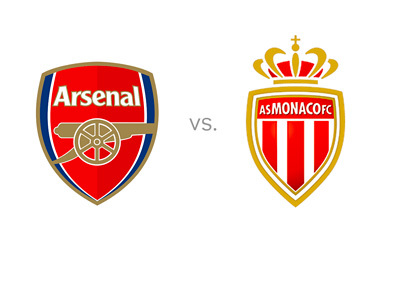 The Gunners though will take heart from Monaco's poor track record in goal-scoring. Their Ligue 1 tally stands at 26 currently compared to a prolific count of 50 goals for Lyon. Amazingly their paltry four goals were enough to take them to the top of their group in the Champions League ahead of Bayer Leverkusen. The likes of Olivier Giroud, Alexis Sanchez and Danny Welbeck can surely contemplate on the prospect of launching waves of attack on Leonardo Jardim's defense-oriented Monaco side without the fear of being counter-attacked too often. The Gunners are on a great recovery spree at the moment. From a lowly 7th position a couple of months ago, they have catapulted to 3rd last week. The attacking duo of Giroud and Sanchez have combinedly scored 29 goals this season and look good for much more. In the last 6 matches Arsenal have lost just one to Tottenham 1-2 and won the remaining 5, finding the back of the net on 14 occasions. Monaco's effort at the Emirates would revolve around the 28-year Portuguese midfielder Joao Moutinho. His job will be to ensure that his team keep possession and also act as an intermediary between the defensive and center-forward positions. Monaco will be banking on their 34-year old Dimitar Berbatov for the rare goal. The Bulgarian striker has 6 Ligue goals from 17 matches this season and scored one of the club's four goals in the Champions group stages from his two appearances in the tournament. The most successful European outing for Monaco was in 2003/04 when they finished runners-up in the Champions League. Their last Round of 16 appearance, way back in 2004/05, resulted in a 0-3 defeat to PSV Eindhoven. Compare that to the 15th consecutive Round of 16 appearance for the Gunners. Arsenal has history heavily on their side and which is why the bookies clearly favor them.